We could replace these with fresh easily enough, we have tomato plants growing which will provide us a far tastier meal. But what happens when the tomato season finishes? Well that's where preserving comes in. 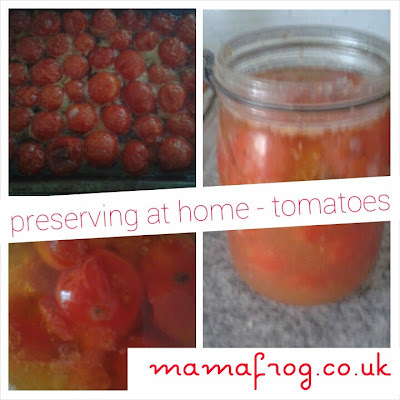 I trialed preserving with some marked down cherry tomatoes at my local green grocers (1kg for £1- bargain). The idea for preserving comes from house dried tomatoes a chef at our last restaurant used to make. Once cooked and cooled I transferred into a sterile and covered in the remaining oil. Stored in the fridge or freezer these last for quite a while. They taste so much better than canned tomatoes and definitely much more versatile and eco friendly. They are a great way to liven up salads, pasta or cous cous.